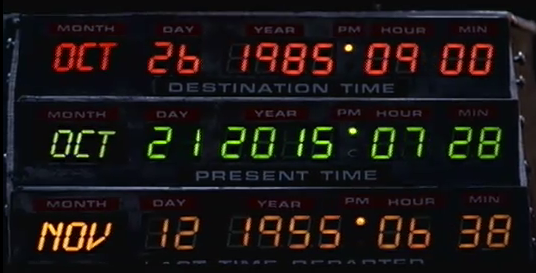 The dashboard in the DeLorean from Back to the Future II shows Marty McFly set to time travel from Oct. 26, 1985 to today, Oct. 21, 2015. Twenty-six years ago Doc Brown set the time-traveling DeLorean for Oct. 21, 2015 so Marty McFly could set out to fix the future. In honor of “Back to the Future” Day we are celebrating two futuristic construction technologies: a bricklaying robot and termite inspired robots that build walls. They might not be as cool as a flying car or the Lexus hoverboard seen in the video below, but check out our blog in 2041 to see if these construction innovations have become mainstream tools. The most tedious tasks are perhaps the most ripe for automation. And there’s probably no task more tedious than laying brick. That’s why Victor, New York-based Construction Robotics has developed SAM, which stands for Semi-Automated Mason. Laying 180 to 200 bricks per hour, SAM is three to five times faster than a human mason. While SAM still requires a human to set it up and load it with bricks and mortar before operating it, that human worker will be doing less strenuous and repetitive activities that can take a toll on their bodies. A team from Harvard recently developed a series of robots that can build walls the same way some termites cooperate to build complex mounds. These termite shelters have been known to rise as high as 17 feet, but the termites operate with little to no centralized supervision. They stay out of each others way even though they don’t work as teams. Like the termites, these robots known as TERMES build independently of one another to construct user-specified structures. The four-by-seven-inch robots use sensors to detect what’s immediately near them as they manipulate blocks to build tall structures. They don’t have preprogramed paths or tasks. They move according to an algorithm that simply provides guiding principles. This type of robot is appealing for construction jobs too dangerous for man, such as building a shelter on Mars before astronauts arrive. More practically, they could also be used to build underwater shelters for divers or sandbag levees in flood zones so the National Guard can stay out of harm’s way. Stay tuned for future blog posts about Smart Buildings and Smart Cities. To check out our last Smart Cities story, click here.